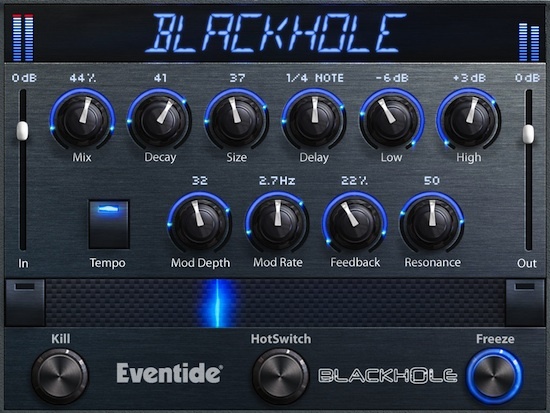 This is what Eventide have to say about their Blackhole…. Blackhole is a massive reverberator that has evolved over the years by pulling in mass quantities of time and energy (of the development persuasion, of course). In its earliest incarnation – first in the DSP4000 and later in the H8000 flagship processors - it was regarded, by some, as a secret weapon. Recently it was tuned, expanded and enhanced and then unleashed in the Eventide Space stompbox. Now, it’s available as a Native plug-in. We’re now wrapping up development of our newest product, the Blackhole reverb plug-in for AAX, Audio Units, and Windows VST. However, before we finish we want to run a short public beta to allow you a chance to try the plug-in and let us know what you think. If you wish to participate in the public beta, follow the relevant link below to enter your ilok.com account name and receive a 14 day trial license for the Blackhole plug-in. You can download the beta version of the plug-in from the Eventide Native Plug-ins Support Page, which you can find in the links below. And, if you run into any problems, or have any feedback for us, please use the link to the Blackhole Beta Forum below to let us know. Participation in this Beta, and the accompanying license, is for the time limited beta period only. Download of the Beta license will not impede your ability to request a 14 day Demo license at a later date. Go to the Eventide web site to get the beta. You need an iLok2 to run the Blackhole Plug-in. The iLok Beta license for Blackhole can be obtained here. The installer files can be downloaded from the Native Plug-ins Support Page. Visit the Blackhole Public Beta Forum here.